Moderna Therapeutics Deal with Merck: Are Personalized Vaccines here? Curator & Reporter: Stephen J. Williams, Ph.D.
KENILWORTH, N.J. & CAMBRIDGE, Mass.–(BUSINESS WIRE)–Merck (NYSE:MRK), known as MSD outside the United States and Canada, and Moderna Therapeutics today announced a strategic collaboration and license agreement to develop and commercialize novel messenger RNA (mRNA)-based personalized cancer vaccines. The collaboration will combine Merck’s established leadership in immuno-oncology with Moderna’s pioneering mRNA vaccine technology and GMP manufacturing capabilities to advance individually tailored cancer vaccines for patients across a spectrum of cancers. Moderna and Merck will develop personalized cancer vaccines that utilize Moderna’s mRNA vaccine technology to encode a patient’s specific neoantigens, unique mutations present in that specific patient’s tumor. When injected into a patient, the vaccine will be designed to elicit a specific immune response that will recognize and destroy cancer cells. The companies believe that the mRNA-based personalized cancer vaccines’ ability to specifically activate an individual patient’s immune system has the potential to be synergistic with checkpoint inhibitor therapies, including Merck’s anti-PD-1 therapy, KEYTRUDA® (pembrolizumab). In addition, Moderna has developed a rapid cycle time, small-batch manufacturing technique that will uniquely allow the company to supply vaccines tailored to individual patients within weeks. Under the terms of the agreement, Merck will make an upfront cash payment to Moderna of $200 million, which Moderna will use to lead all research and development efforts through proof of concept. The development program will entail multiple studies in several types of cancer and include the evaluation of mRNA-based personalized cancer vaccines in combination with Merck’s KEYTRUDA® (pembrolizumab). Moderna will also utilize the upfront payment to fund a portion of the build-out of a GMP manufacturing facility in suburban Boston for the purpose of personalized cancer vaccine manufacturing. Following human proof of concept studies, Merck has the right to elect to make an additional undisclosed payment to Moderna. If exercised, the two companies will then equally share cost and profits under a worldwide collaboration for the development of personalized cancer vaccines. Moderna will have the right to elect to co-promote the personalized cancer vaccines in the U.S. The agreement entails exclusivity around combinations with KEYTRUDA. Moderna and Merck will each have the ability to combine mRNA-based personalized cancer vaccines with other (non-PD-1) agents. Merck and Moderna have an existing collaboration and license agreement focused on the discovery and development of mRNA-based infectious disease vaccines and passive immunity treatments. Moderna is also advancing its own pipeline of infectious disease vaccine candidates and currently has two phase 1 studies underway in Europe and the U.S.
Caperna, focused on personalized cancer vaccines. Cambridge-based Moderna is privately held and currently has strategic agreements with AstraZeneca, Alexion Pharmaceuticals and Merck. To learn more, visit www.modernatx.com. Our efforts are helping Moderna and the industry to flatten the mRNA learning curve across the full breadth of competencies needed to drive the platform forward, including chemistry, mRNA biology, formulation, process development, automation and high-throughput production, quality, and Good Manufacturing Practice (GMP) manufacturing. Building from our mRNA core expression platform, we have created a new scale of drug discovery and development that enables a series of new drug modalities. Each modality represents a distinct approach to using the mRNA platform to encode proteins that achieve a therapeutic benefit, enabling us to develop numerous drug candidates across a wide array of therapeutic areas. Vaccines are substances that teach the immune system to rapidly recognize and destroy invading pathogens such as bacteria or viruses, preparing the body’s adaptive immunity for future exposure to the pathogen. Historically, vaccines have introduced immune-activating markers from pathogens into the body. Conversely, Moderna is developing mRNA-based vaccines that enable the body to produce and present immunogenic proteins to the immune system. Moderna is also developing mRNA-based personalized cancer vaccines to prime the immune system to recognize cancer cells and mount a strong, tailored response to each individual patient’s cancer. 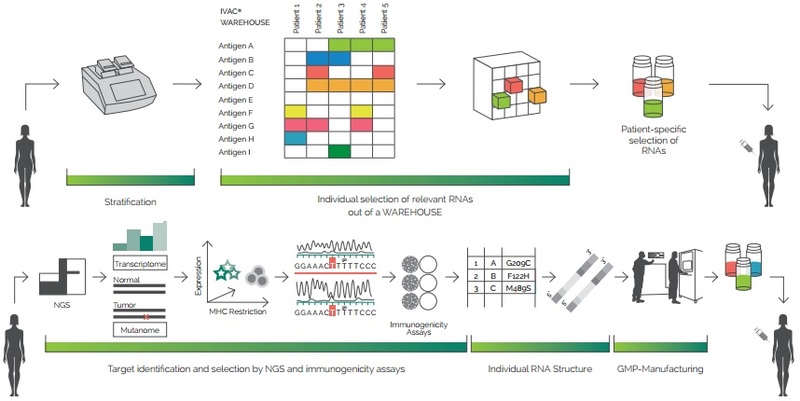 Moderna’s technology allows for a rapid turn-around time in production of these unique mRNA vaccines. Many diseases are caused by defects in proteins that function inside cells. Existing methods of protein-based therapy do not allow for proteins to reach the intracellular space, and as such are unable to replace the defective, disease-causing proteins within cells. Moderna’s platform allows for the development of mRNA therapies that can stimulate production of intracellular proteins as well as transmembrane proteins. This could potentially lead to a novel approach to treating a vast array of rare genetic and other diseases caused by intracellular protein defects. Many targets for the treatment of cancer have been identified but their therapeutic potential has been limited by either the inability to access these targets, or by systemic toxicities. Moderna’s platform allows for localized expression of therapeutic proteins within the tumor microenvironment. Antibodies are secreted proteins that bind to and inhibit specific targets. Moderna’s platform has the potential to stimulate the body’s own cells to produce specific antibodies that can bind to cellular targets. Proteins are large, complex molecules that have many critical functions both inside and outside of cells. Moderna’s platform stimulates cells to produce and secrete proteins that can have a therapeutic benefit through systemic exposure. Caperna LLC is the fourth Moderna venture company — formed, funded and wholly-owned by Moderna — and focused exclusively on the advancement of personalized cancer vaccines. Caperna will apply Moderna’s mRNA vaccine technology to the field of cancer vaccines, building on advances in recent years in cancer immunotherapy. Utilizing Moderna’s demonstrated engineering and process capability to synthesize over 1,000 unique novel mRNA’s per month in Moderna’s, automated, in-house productions systems. This provides the basis for a vision of rapid turnaround times that will allow Caperna’s personalized cancer vaccine, customized after tumor biopsy and sequencing to code for specific neoantigens in patients’ tumors, to be used to treat patients with aggressive tumors and high unmet need (rather than those with less aggressive tumors which can’t wait for prolonged turnaround times). Caperna will develop its personalized cancer vaccines in combination with checkpoint inhibitors that unleash the immune system and other cancer immunotherapies. President: Tal Zaks, M.D., Ph.D.
Head of Research: Nicholas Valiante, Ph.D.
Head of Operations: Ted Ashburn, M.D., Ph.D.
Headquarters: 500 Technology Square, Cambridge, Mass. Onkaido Therapeutics is the first Moderna venture company – formed, funded and wholly-owned by Moderna. Onkaido is focused exclusively on developing mRNA-based oncology treatments for currently undruggable targets or as a superior alternative to existing drug modalities. Onkaido is leveraging all of the tools and modalities developed at Moderna, with plans to rapidly turn mRNA science into truly novel cancer therapies that can make a real difference for patients. Onkaido is currently focused on three therapeutic areas of oncology drug discovery and development: immuno-oncology, hepatocellular carcinoma (liver cancer) and myeloid malignancies – with programs investigating multiple targets and therapies simultaneously. Onkaido scientists are also exploring the power of mRNA technology in precision cancer pharmacology – researching areas such as tumor biology, targeting and gene silencing, driving the science toward the delivery of truly personalized cancer treatment. Valera LLC is the second Moderna venture company — formed, funded and wholly-owned by Moderna — and focused exclusively on the advancement of vaccines and therapeutics for the prevention and treatment of viral, bacterial and parasitic infectious diseases. The vaccines work of Valera builds on a body of preclinical research at Moderna showing the ability of modified mRNA to express viral antigens in vivo and to induce robust immune responses. Valera’s therapeutic passive immunity programs will expand on Moderna’s research using mRNA to express antibodies that bind to viral and other targets. The robust data from these programs across a range of preclinical infectious disease models, together with the inherent, rapid turn-around time in creating novel mRNA constructs, provide Valera with a potentially powerful and versatile new platform for the creation of a broad array of vaccines and passive immunity therapies. Chief Scientific Officer: Giuseppe Ciaramella, Ph.D.
Interim Chief Medical Officer: Tal Zaks, M.D., Ph.D.
Now that Galena has added fresh evidence that first-gen cancer vaccines make for a poor R&D program, Merck is betting $200 million upfront that the next-gen neoantigen approach to personalized cancer vaccines can succeed where all else has failed. Merck is tying up with the mRNA specialists at Cambridge, MA-based Moderna, which has inked a long lineup of marquee partnerships. The big idea here is that each person’s cancer cells present unique “neoantigens” that can be used to tailor a cancer vaccine for each patient. That’s a radical idea that has gained considerable steam in recent months, with Gritstone and Neon Therapeutics — paired now with Bristol-Myers on Opdivo — rounding up significant venture cash. Biotech billionaire Patrick Soon-Shiong has also jumped into the game, including it in its growing slate of cancer R&D work in a group of startups. Moderna says it has already set up a manufacturing system that can be used to create these personalized vaccines in a matter of weeks. And Merck will use the partnership to advance new combination therapies that include its checkpoint inhibitor Keytruda. The way the deal works, Moderna notes in its statement, is that Merck can step up after it sees some evidence in humans that the tech is working as planned. After human proof-of-concept, if Merck wants to opt in they can pay a significant milestone and then both companies can share the cost on Phase III and commercializations, profiting equally.Moderna CEO Stéphane Bancel says they can jump into the clinic next year. The deal marks another rare pact by Merck R&D chief Roger Perlmutter, who’s been carefully focused on making Keytruda a foundation franchise that can sustain the company for years to come. While Merck has been a couple of steps behind Bristol-Myers in gaining market share, Perlmutter’s not settling for a second place finish. Galena Biopharma fell more than 80% in premarket trading on news that an Independent Data Monitoring Committee (IDMC) stopped a Phase III trial of its NeuVax in early stage breast cancer for futility. The company is waiting to evaluate the data from the study, known as PRESENT, to determine its next steps. It will hold a conference call next week to review the data and to update its immunotherapy and hematology pipeline plans. NeuVax is the company’s lead candidate; it has it in an additional 4 clinical trials in various indications. It also has a pair of Phase II candidates: immunotherapy GALE-301 in ovarian and endometrial cancer and GALE-401 (Anagrelide CR) in MPN-related thrombocytosis. The trial halt came at a planned safety and futility interim analysis that was triggered after 70 qualifying disease free survival (DFS) events. “At this time the DMC recommends that the study be stopped for futility unless it is determined that there has been a systematic reversal in the study drug treatments in the two arms, in which case the IDMC should reevaluate the clinical evidence,” the committee said in a letter disclosed by Galena. NeuVax (nelipepimut-S) is a cancer immunotherapy targeting human epidermal growth factor receptor (HER2) expressing cancers. It’s an immunodominant nonapeptide derived from the extracellular domain of the HER2 protein. It is combined with GM-CSF for injection under the skin. The PRESENT trial enrolled 758 patients with a primary endpoint of disease free survival (DFS) upon reaching 141 events with three years minimum of follow-up. The trial is in breast cancer patients who are node positive, HER2 IHC 1+/2+, and HLA A2+ and/or A3+. The study is double blind, randomized 1:1, and is stratified by stage, type of surgery, hormone receptor status, and menopausal status. Galena had $34.7 million in cash at the end of the first quarter, with an operating loss for that period of $13.1 million. So, at that point it already had less than roughly three quarters of runway. BioNTech and its academic partners have published in well-know publication Nature. The work describes the first clinically applicable and systemic mRNA cancer immunotherapy vaccine. The biggest private Biotech in Europe, BioNTech is one of major players in the mRNA field – along with money-magnet Moderna (US) and CureVac (Germany), which has already raised €300M. BioNTech is now disclosing a major achievement: the first clinically relevant and systemic mRNA cancer vaccine in the world. Results show that the therapy has a body-wide effect and elicits a strong immune response. The work was published in renowned scientific journal Nature, and also has the contributions of several academic and clinical partners – TRON, Research Center for Immunotherapy (FZI), the University Medical Center at the Johannes Gutenberg University Mainz and the Heidelberg University Hospital. With this research, the group has pioneered a novel approach to target a nanoparticle mRNA vaccine (RNA-LPX) to dendritic cells (that collect antigens to present to cells of the immune system) in different parts of the body – spleen, lymph nodes and bone marrow. Once the mRNA interacts with the dendritic cells, it rapidly sparks off a potent response that mimics a natural antiviral immune response. It works with a dual mechanism, involving both the adaptive (T-cell-mediated) and innate (type-I interferon (IFN)-mediated) immune system. This innate response is particularly important for the full anti-tumor effects of the vaccines. Besides a promising mode of action and efficacy data from preclinical tumor models, the work also presents early data from a Phase I trial in patients with melanoma. In the human body, RNA carries out diverse tasks. One of its key functions is the translation of genetic information into proteins. Messenger RNA (mRNA) acts as the carrier of specific building blocks for this process. Scientists have long sought to utilize this ingenious, natural concept for medical purposes, but up until just a few years ago, the molecule itself was considered uncontrollable, especially under clinical conditions. RNA was viewed as being too unstable, not particularly effective and was dwarfed by its sister DNA, the other and more prominent naturally occurring nucleic acid. We have always held true to utilizing RNA, as we believe the first biomolecule of emerging life that nature designed could never be a faulty design. CureVac has generated its technologies to make RNA manageable and more stable, thus optimizing its properties. CureVac’s active ingredients do not negatively manipulate the body, but rather work based on the very same functional principles found in nature. Our format is simple: the body receives specific information coded in RNA and uses this information to produce its own, custom-tailored protein as medicine. After CureVac’s founding in 2000, we developed several technologies with which we specifically formulate and use RNA as the basic molecule in different ways. RNActive® – Developed based on optimized, antigen-encoding and complexed mRNA molecules – stimulates the immune system, thereby providing potent vaccines for the prevention of infectious diseases or supplying potent novel immunotherapies against cancer. RNArt® – Our novel mRNA-based approach in molecular therapy designed to trigger the body’s own production of desired proteins for therapeutic purposes. RNAntibody® – Enables the prolonged expression of functional antibodies and antibody-like proteins from unmodified mRNA. This transient, reusable and safe passive immunization platform can be used in prophylactic and therapeutic settings for a range of indications. RNAdjuvant® – Developed based on long-chain, non-coding RNA molecules – improves the quantity and quality of the immune response, thereby amplifying the effects of immunotherapeutic treatments against cancer or of conventional vaccines used to prevent infectious diseases. In addition to generating our own technology platform, CureVac maintains its own in-house GMP (Good Manufacturing Practice)-compliant pharmaceutical production facility. Here, we are able to manufacture all of our optimized RNA-based active ingredients. PureMessenger® – A process developed by CureVac in which RNA is produced with a specifically desired composition and amount in an extremely pure form. CureVac is the leading mRNA company with unique expertise and know-how for the production and therapeutic application of mRNA. We are exploring the full therapeutic range for this innovative new class of medicine with our diverse platforms RNActive®, RNArt® and RNAdjuvant®. By partnering with strong pharmaceutical companies and organizations, we are in a position to fully unleash the huge potential of mRNA to the benefit of those that need new therapeutic options most. We are the RNA people and want to share our vision to explore the transformative potential of this new technology with those who truly believe in innovation. We are looking for partners who share with us our desire to revolutionize medicine and want to collaborate with like-minded organizations that want to make a real change. We are motivated by challenges and see technical hurdles as opportunities to grow – as individuals and as an organization. Contact us if you are interested in discussing our clinical programs or want to develop new innovative tumor vaccine cocktails based on several full-length antigens to optimally tackle specific tumor types. Contact us if you are interested in identifying or optimizing new antigens for hard-to-treat pathogens, regardless as to whether they are viruses, bacteria or parasites. You want to optimize immunogenicity directly in humans in a Phase I setting? You are interested in a vaccine that doesn’t require a cold chain and can be produced very rapidly in case of an emergency or pandemic setting? Just let us know and we’ll figure out the best way to collaborate. Contact us if you are keen to explore untapped areas for new therapeutics. The limit is your imagination as to how our versatile platform can be tailored to address your therapeutic needs. Are you looking for local or systemic administration? Have you thought about therapeutic proteins acting within the cell? Any ideas about smart combinations of functional protein domains? Get in touch and we’ll explore creative ways to collaborate. Contact us if you need to trigger a long lasting humoral and cellular immune response. Do you need to boost a potent immune response with your peptide- or protein-based vaccine? Are you interested in achieving dose-sparing with your established vaccine? Based on your proposal, we are very open to share our RNAdjuvant® under MTA to enable you to test it in your experimental environment. The delivery of DNA or RNA for the in vivo production of antigen was first reported more than two decades ago,5,6 for both prophylaxis and immune therapy of disease. The attraction of these platforms originated from a paradigm shift engendered by NAV technology.7 NAVs enable indefinite repeat boosting because they are not subject to neutralization by the host immune response, thus facilitating boosting even in seropositive individuals. NAVs also drive antigen expression in vivo by the host, and therefore generate antigens that are highly relevant to protection and/or immune treatment of the specific pathogen or cancer. As such, they express host-specific modifications of the relevant antigens that are difficult or impossible to achieve when ex vivo antigen-production systems are used. Although these immunogens are not live, in theory they should induce immunity similar to that following live infection, challenging the vaccine paradigm that only live- or abortive infection–antigen approaches induce diverse CD8 T-cell immunity. NAVs appear to have considerable manufacturing advantages and can easily be combined to form multi-antigen products; this has propelled the platform into clinical studies. Still, the initial clinical performance of the DNA vaccine platform was surprisingly weak. There were no significant safety issues, but the platform did not induce consistent CD8 T-cell immunity or seroconversion. DNA was subsequently used as a prime-boost modality, a function it served for more than a decade. Within the past few years, however, advances in genetic engineering, delivery, and formulation have resulted in much more robust DNA-based vaccines.5,8 By contrast, direct RNA vaccination has lagged behind. Reports advancing RNA immunization strategies have relied largely on an ex vivo route9,10—RNA for antigen expression is transfected into patient-derived dendritic cells (DC) ex vivo, followed by reinfusion of the cells as a way to tailor patient-specific immune responses. This approach is being clinically investigated for immunotherapy against colorectal, lung, prostate, and pancreatic cancer; neuroblastoma; and melanoma, among others. Improvements in methods for mRNA synthesis and stabilization and development of improved self-amplifying RNA have yielded promising results in animals over the past year. In the study by Petsch et al., protection was observed in both young and old mice, which was encouraging, and combinations of mRNA were effective in as few as one immunization in mice.2 Through optimization of the GC content of the synthetic mRNA and by optimizing the untranslated region, as well as complexing the mRNA with protamine, to protect the mRNA from RNase, the in vivo performance of this platform was improved. Furthermore, the vaccines induced immune responses in ferrets and pigs that resulted in disease attenuation upon challenge with virus. The results imply that such an mRNA approach could allow for more rapid generation of new influenza vaccines. A recent report by Geall et al.3 further extends the direct RNA immunization field using self-amplifying RNA technology. This strategy builds off of early work using alphavirus replicons for in vivo immunization and gene delivery.11 Geall et al. report that, by delivering the alphavirus genes encoding the RNA replication machinery along with the recombinant viral target antigens, which in this case was the respiratory syncytial virus fusion glycoprotein, very low doses of RNA can result in the generation of strong antigen-specific immunity in mice. The responses induced compared favorably with those induced by older, unoptimized DNA vaccines delivered by electroporation and were superior to mRNA vaccines encoding the same F antigen. Further studies in larger animal systems are clearly warranted; these should include evaluation of immune performance in nonhuman primate models such as macaques. RNA approaches have conceptual advantages as well as disadvantages in relation to other vaccine technologies. They are simple, can be delivered directly into the cytoplasm, and do not require nuclear localization to generate expression. Self-amplifying mRNA vectors expand replication by providing the replication machinery for the RNA to increase copy number, they also provide a unique target for host immunity to home in on in the replication-machinery proteins themselves. It will be important to understand which, if any, of these conceptual issues may limit or help these technologies. In addition, stabilized mRNA approaches have conceptual advantages such as longer half-life, which generates longer expression time, and formulations that are simpler than those of viral vector systems. Conversely, RNA approaches strongly stimulate the host’s innate defense system. They do this, in part, through activation of the TLR3 and 7/8 pathways, which recognize double- and single-stranded RNA, respectively, resulting in inflammatory activation and the generation of type 1 interferon (IFN).12 Type 1 IFN can either promote or inhibit generation of an adaptive immune response and can have unwanted effects on the host, such as induction of fever or flu-like symptoms and increased expression of autoantigens. In this regard, a study by Pollard et al.4 published recently in Molecular Therapy is enlightening. They reported on the feasibility of using mRNA encoding the HIV gag antigen complexed with DOTAP/DOPE as an immunization strategy. They observed a strong effect of interferon (IFN) on the resulting immunity to this vaccine when delivered into DCs for immunization. Whereas low levels of type 1 IFN may help to drive host immunity, higher levels can shut down the cellular transcriptional machinery, thus negatively impacting mRNA vaccine potency. Pollard et al. investigated this hypothesis by studying their mRNA vaccine in normal DCs as well as DCs derived from IFN-α receptor–deficient mice. They observed that IFN-αR-deficient cells were superior for driving gag-specific T-cell responses in their immune-therapy protocol. These results support the idea that IFN-αR signaling is not required for productive innate immune activation and recruitment of DCs in these mRNA/DOTAP immunized mice, suggesting that new synthetic RNA approaches, modified to reduce innate immunity,13 may have important advantages for in vivoimmunization and ex vivo DC applications. It is encouraging that new approaches to building this next generation of RNA immunogens are helping to send their immune message loudly and clearly. Immunother Cancer. 2015; 3: 26. NEW YORK (GenomeWeb) – Researchers from the US and the Netherlands reported in the New England Journal of Medicine that they have identified mutations in immune system-related genes in individuals who initially responded to anti-PD-1 treatment for metastatic melanoma treatment, but relapsed after six months or more. A team led by investigators at the University of California at Los Angeles, the Jonsson Comprehensive Cancer Center, and the Netherlands Cancer Institute did exome sequencing on tumor samples from four individuals with metastatic melanoma prior to treatment with pembrolizumab (marketed as Keytruda by Merck). The researchers also assessed protein-coding sequences in tumor samples taken after late relapse, comparing the baseline and relapse tumors to search for mutations related to checkpoint blockade therapy resistance. They uncovered suspicious mutations in three of the four individuals. In one individual, for example, they saw a truncating mutation affecting the beta-2-microglobulin (B2M) gene, which contributes to expression of class I major histocompatibility complex molecules recognized by the immune system’s CD8 T cells. Two more relapse tumors contained loss-of-function mutations to JAK1 or JAK2 — genes coding for interferon-related kinase enzymes. While roughly three-quarters of individuals treated with anti-PD-1 therapies show durable treatment responses, acquired resistance can occur, even long after immunotherapy-mediated tumor regression. The team started with 78 metastatic melanoma patients who were treated with pembrolizumab at UCLA. Of the 42 individuals who showed an objective response to the checkpoint blockade therapy, 15 eventually experienced disease progression. From that group of 15 patients, the researchers focused on four patients with late-acquired resistance — six months or more after response to pembrolizumab as a single agent — for whom there was sufficient biopsy material and clinical information available. Each of the patients had been receiving continuous doses of the drug until relapse, which occurred after a mean of nearly 21 months. When the investigators scrutinized biopsies from the relapse tumors, they saw enhanced PD-L1 expression at the edges of tumors, along with CD8 T cells attempting to infiltrate the tumors. After capturing protein-coding portions of the genome in baseline and relapse tumor samples with Nimblegen exome kits, the team sequenced the exomes to nearly 150-fold average coverage using the Illumina HiSeq 2000. “We wanted to capture all of the mutations down to low allele frequencies to get a picture of everything that was going on in the tumors, both before they went on the treatment and after [the tumors] came back,” Zaretsky said. In the two cases marked by new JAK1 or JAK2 mutations at relapse, the team found that 93 percent to nearly 96 percent of baseline tumor mutations persisted in the relapse tumors. Even so, they didn’t detect burgeoning resistance mutations in the pre-pembrolizumab-treatment tumors, Zaretsky said, perhaps because such alterations were present in very few cells in the baseline tumors. In cell lines established from the individual with JAK2 loss-of-function mutations at relapse, the team’s NanoString Technologies’ nCounter expression experiments pointed to loss of JAK2 protein expression after treatment progression, along with a dip in interferon gamma activity and diminished production of proteins involved in antigen presentation and T cell activity. Optimizing NKT cell ligands as vaccine adjuvants. Carreño LJ1, Kharkwal SS, Porcelli SA. NKT cells are a subpopulation of T lymphocytes with phenotypic properties of both T and NK cells and a wide range of immune effector properties. In particular, one subset of these cells, known as invariant NKT cells (iNKT cells), has attracted substantial attention because of their ability to be specifically activated by glycolipid antigens presented by a cell surface protein called CD1d. The development of synthetic α-galactosylceramides as a family of powerful glycolipid agonists for iNKT cells has led to approaches for augmenting a wide variety of immune responses, including those involved in vaccination against infections and cancers. Here, we review basic, preclinical and clinical observations supporting approaches to improving immune responses through the use of iNKT cell-activating glycolipids. Results from preclinical animal studies and preliminary clinical studies in humans identify many promising applications for this approach in the development of vaccines and novel immunotherapies. Cancer Res. 2013 Jul 1;73(13):3842-51. doi: 10.1158/0008-5472.CAN-12-1974. Epub 2013 May 23. Avirulent Toxoplasma gondii generates therapeutic antitumor immunity by reversing immunosuppression in the ovarian cancer microenvironment. Baird JR1, Fox BA, Sanders KL, Lizotte PH, Cubillos-Ruiz JR, Scarlett UK, Rutkowski MR, Conejo-Garcia JR, Fiering S, Bzik DJ. Reversing tumor-associated immunosuppression seems necessary to stimulate effective therapeutic immunity against lethal epithelial tumors. Here, we show this goal can be addressed using cps, an avirulent, nonreplicating uracil auxotroph strain of the parasite Toxoplasma gondii (T. gondii), which preferentially invades immunosuppressive CD11c(+) antigen-presenting cells in the ovarian carcinoma microenvironment. Tumor-associated CD11c(+) cells invaded by cps were converted to immunostimulatory phenotypes, which expressed increased levels of the T-cell receptor costimulatory molecules CD80 and CD86. In response to cps treatment of the immunosuppressive ovarian tumor environment, CD11c(+) cellsregained the ability to efficiently cross-present antigen and prime CD8(+) T-cell responses. Correspondingly, cps treatment markedly increased tumor antigen-specific responses by CD8(+) T cells. Adoptive transfer experiments showed that these antitumor T-cell responses were effective in suppressing solid tumor development. Indeed, intraperitoneal cps treatment triggered rejection of established ID8-VegfA tumors, an aggressive xenograft model of ovarian carcinoma, also conferring a survival benefit in a related aggressive model (ID8-Defb29/Vegf-A). The therapeutic benefit of cps treatment relied on expression of IL-12, but it was unexpectedly independent of MyD88 signaling as well as immune experience with T. gondii. Taken together, our results establish that cps preferentially invades tumor-associated antigen-presenting cells and restores their ability to trigger potent antitumor CD8(+) T-cell responses. Immunochemotherapeutic applications of cps might be broadly useful to reawaken natural immunity in the highly immunosuppressive microenvironment of most solid tumors. Oncoimmunology. 2013 Jun 1;2(6):e24677. Epub 2013 Apr 29. TLR3 agonists improve the immunostimulatory potential of cetuximab against EGFR+ head and neck cancer cells. Ming Lim C1, Stephenson R, Salazar AM, Ferris RL. Toll-like receptor 3 (TLR3) agonists have been extensively used as adjuvants for anticancer vaccines. However, their immunostimulatory effects and precise mechanisms of action in the presence of antineoplastic monoclonal antibodies (mAbs) have not yet been evaluated. We investigated the effect of TLR3 agonists on cetuximab-mediated antibody-dependent cellular cytotoxicity (ADCC) against head and neck cancer (HNC) cells, as well as on dendritic cell (DC) maturation and cross-priming of epidermal growth factor receptor (EGFR)-specific CD8+ T cells. The cytotoxic activity of peripheral blood mononuclear cells (PBMCs) or isolated natural killer (NK) cells expressing polymorphic variants (at codon 158) of the Fcγ receptor IIIa (FcγIIIa) was determined in 51Cr release assays upon incubation with the TLR3 agonist poly-ICLC. NK cell stimulation was measured based on activation and degranulation markers, while DC maturation in the presence of poly-ICLC was assessed using flow cytometry. The DC-mediated cross priming of EGFR-specific CD8+ T cells was monitored upon in vitro stimulation with tetramer-based flow cytometry. TLR3-stimulated, unfractionated PBMCs from HNC patients mediated robust cetuximab-dependent ADCC, which was abrogated by NK-cell depletion. The cytolytic activity of TLR3-stimulated NK cells differed among cells expressing different polymorphic variants of FcγRIIIa, and NK cells exposed to both poly-ICLC and cetuximab expressed higher levels of CD107a and granzyme B than their counterparts exposed to either stimulus alone. Poly-ICLC plus cetuximab also induced a robust upregulation of CD80, CD83 and CD86 on the surface of DCs, a process that was partially NK-cell dependent. Furthermore, DCs matured in these conditions exhibited improved cross-priming abilities, resulting in higher numbers of EGFR-specific CD8+ T cells. These findings suggest that TLR3 agonists may provide a convenient means to improve the efficacy of mAb-based anticancer regimens. Ann Oncol. 2012 Sep; 23(Suppl 8): viii6–viii9. Evidence has been accumulating since the middle of the last century, first from animal models and later from studies in cancer patients, that the immune system can recognise and reject tumours. The goal of tumour immunology has been to understand the components of the immune system that are important for tumour immunosurveillance and tumour rejection to understand how, when, and why they fail in cases of clinical disease. Immunotherapy, which involves strengthening the cancer patient’s immune system by improving its ability to recognise the tumour or providing a missing immune effector function, is one treatment approach that holds promise of a life-long cure . Studies of cancer–immune system interactions have revealed that every known innate and adaptive immune effector mechanism participates in tumour recognition and control . The first few transformed cells are detected by NK cells through their encounter with specific ligands on tumour cells. This leads to the destruction of some transformed cells and the uptake and processing of their fragments by macrophages and dendritic cells. In turn, these macrophages and dendritic cells are activated to secrete many inflammatory cytokines and present tumour cell-derived molecules to T- and B cells. Activation of T- and B cells leads to the production of additional cytokines that further promote activation of innate immunity and support the expansion and production of tumour-specific T cells and antibodies, respectively. The full power of the adaptive immune system leads to the elimination of remaining tumour cells and, importantly, to the generation of immune memory to specific tumour components that will serve to prevent tumour recurrence. Effectors of adaptive immunity, such as CD4+ helper T cells, CD8+ cytotoxic T cells, and antibodies, specifically target tumour antigens; i.e. 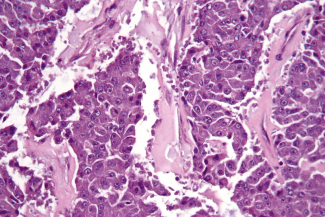 molecules expressed in tumour cells, but not in normal cells. Tumour antigens are normal cellular proteins that are abnormally expressed as a result of genetic mutations, quantitative differences in expression, or differences in posttranslational modifications . In tumour types that have a well-documented viral origin, such as cervical cancer, caused by the human papillomavirus , or hepatocellular carcinoma caused by the hepatitis B virus , viral proteins can also serve as tumour antigens and targets for antitumour immune response . The first indication that tumours carried molecules distinct from those on the normal cell of origin was derived from immunising mice with human tumours and selecting antibodies that recognised human tumour cells but not their normal counterparts. The major question was whether some, or all, of these molecules would also be recognised by the human immune system. 2011 was an important anniversary for human tumour immunology, marking 20 years since the publication by van der Bruggen et al. that described the cloning of MAGE-1, a gene that encodes a human melanoma antigen recognised by patient’s antitumour T cells. This was not a mutant protein; its recognition by the immune system was due to the fact that it was only expressed by transformed, malignant cells and, with the exception of testicular germ cells, was not expressed in normal adult tissue. Many similar discoveries followed, with each new molecule providing a better understanding of what might be good targets for different forms of cancer immunotherapy. Tumour antigens have been tested as vaccines, as targets for monoclonal antibodies, and as targets for adoptively transferred cytotoxic T cells. There is a wealth of publications from preclinical studies targeting these antigens and results from phase I/II clinical trials. Recently, these studies were critically reviewed and a list of tumour antigens with the largest body of available data compiled . The goal was to encourage faster progress in the design, testing, and approval of immunotherapeutic reagents that incorporate or target the most promising antigens. In the past, immunotherapy was referred to as ‘passive’ (e.g. the infusion of preformed immune effectors, such as antibodies, cytokines, or activated T cells, NK cells, or lymphokine-activated killer cells), presumably acting directly on the tumour and independent of the immune system or ‘active’ (e.g. vaccines), designed to activate and therefore be dependent on the patient’s immune system. it has since become clear that both passive and active immunotherapies depend on the patient’s immune system for long-term tumour control or complete tumour elimination. anticancer monoclonal antibodies are a well-established class of immunotherapeutic agent. HOWEVER, The potential of these antibodies is drastically undermined by their administration relatively late in the disease course, when the patient’s immune system is largely compromised. Under more optimal conditions, antibody treatment might result not only in the direct cytostatic or cytotoxic effect on the tumour cell, but also in the loading of antibody-bound tumour antigens onto antigen presenting cells (APC) in the tumour microenvironment. The resultant cross-presentation to antitumour T- and B cells could result in additional antibodies to these antigens being produced, and propagation of the immune response at the tumour site would maintain tumour elimination long after the infused monoclonal antibody is gone. The same scenario could be predicted for adoptively transferred T cells. Unlike antibodies, transferred T cells persist longer and may provide a memory response ; however, as long as the memory response is restricted to one clone, or a limited number of clones, then antigen-negative tumours will be able to escape. In addition, cancer vaccines encounter large numbers of immunosuppressive Tregand MDSC in circulation, as well as immunosuppressive cell-derived soluble products that flood the lymph nodes, preventing maturation of APCs and activation of T cells. 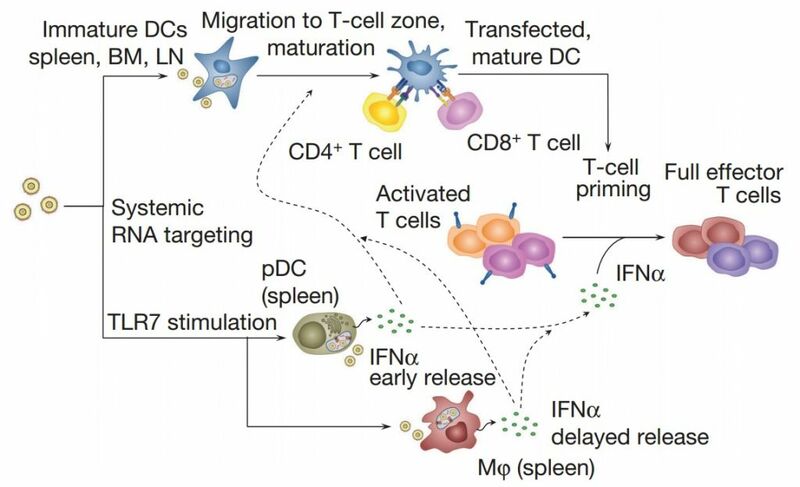 Even when vaccines are delivered in the context of ex vivo matured and activated dendritic cells, their ability to activate T cells is compromised by the high-level expression of various molecules on T cells that block this process. The scenarios proposed above present a rather bleak picture of the potential of immunotherapy to achieve the cure for cancer that has eluded standard therapy . Interestingly, failures of some standard therapies are beginning to be ascribed to their inability to activate the patient’s immune system . However, rather than seeing the picture as a deterrent, it should be considered as a road map, providing at least two major directions for new developments in immunotherapy. The first direction is to continue using the old classes of immunotherapy that target the cancer directly, but to use them in combination with therapies that target the immune system in the tumour microenvironment, such as cytokines, suppressors of Treg or MDSC activity, or antibodies that modulate T-cell activity. The recently approved antibody, ipilimumab, which acts to sustain cytotoxic T-cell activity by augmenting T-cell activation and proliferation, is one example of such an immunomodulatory agent . The other direction is to use immunotherapies, both old and new, for preventing cancer in individuals at high risk . Studies of the tumour microenvironment are providing information about immunosurveillance of tumours from early premalignant lesions to more advanced dysplastic lesions to cancer. At each step, tumour-derived and immune system-derived components have a unique composition that will have distinct effects on immunotherapy. Because these premalignant microenvironments are less developed and immunosuppression is less entrenched, it should be easier to modulate towards the elimination of abnormal cells. Cancer Immunol Immunother. 2011 Sep;60(9):1309-17. doi: 10.1007/s00262-011-1038-y. Epub 2011 May 28. Tumor immunotherapy using adenovirus vaccines in combination with intratumoral doses of CpG ODN. Geary SM1, Lemke CD, Lubaroff DM, Salem AK. The combination of viral vaccination with intratumoral (IT) administration of CpG ODNs is yet to be investigated as an immunotherapeutic treatment for solid tumors. Here, we show that such a treatment regime can benefit survival of tumor-challenged mice. C57BL/6 mice bearing ovalbumin (OVA)-expressing EG.7 thymoma tumors were therapeutically vaccinated with adenovirus type 5 encoding OVA (Ad5-OVA), and the tumors subsequently injected with the immunostimulatory TLR9 agonist, CpG-B ODN 1826 (CpG), 4, 7, 10, and 13 days later. This therapeutic combination resulted in enhanced mean survival times that were more than 3.5× longer than naïve mice, and greater than 40% of mice were cured and capable of resisting subsequent tumor challenge. This suggests that an adaptive immune response was generated. Both Ad5-OVA and Ad5-OVA + CpG IT treatments led to significantly increased levels of H-2 K(b)-OVA-specific CD8+ lymphocytes in the peripheral blood and intratumorally. Lymphocyte depletion studies performed in vivo implicated both NK cells and CD8+ lymphocytes as co-contributors to the therapeutic effect. Analysis of tumor infiltrating lymphocytes (TILs) on day 12 post-tumor challenge revealed that mice treated with Ad5-OVA + CpG IT possessed a significantly reduced percentage of regulatory T lymphocytes (Tregs) within the CD4+ lymphocyte population, compared with TILs isolated from mice treated with Ad5-OVA only. In addition, the proportion of CD8+ TILs that were OVA-specific was reproducibly higher in the mice treated with Ad5-OVA + CpG IT compared with other treatment groups. These findings highlight the therapeutic potential of combining intratumoral CpG and vaccination with virus encoding tumor antigen. Adv Drug Deliv Rev. 2009 Mar 28;61(3):268-74. doi: 10.1016/j.addr.2008.12.005. Epub 2009 Jan 7. CpG oligonucleotide as an adjuvant for the treatment of prostate cancer. The use of an adenovirus transduced to express a prostate cancer antigen (PSA) as a vaccine for the treatment of prostate cancer has been shown to be active in the destruction of antigen-expressing prostate tumor cells in a pre-clinical model, using Balb/C or PSA transgenic mice. The destruction of PSA-secreting mouse prostate tumors was observed in Ad/PSA immunized mice in a prophylaxis study with 70% of the mice surviving long term tumor free. This successful immunotherapy was not observed in therapeutic studies in which tumors were established before vaccination and the development of anti-PSA immune response was not as easily generated in PSA transgenic mice. Immunization of conventional and transgenic animals was enhanced by incorporating a collagen matrix into the immunizing injection. Therefore the need to strengthen anti-PSA and anti-prostate cancer immunity was an obvious next step in developing a successful prostate cancer immunotherapy. Because the use ofimmunostimulatory CpG motifs was shown to enhance immune responses to a wide variety of antigens, our studies incorporated CpG into the Ad/PSA vaccine experimental plans. The results of the subsequent studies demonstrated a dichotomy where Ad/PSA plus CpG enhanced the in vivo destruction of PSA-secreting tumors and the survival of experimental animals, but revealed that the number and in vitro activities of antigen specific CD8+ T cells was decreased as compared to the values observed when the vaccine alone was used for immunization. The dichotomous observations were confirmed using another antigen system, OVA also incorporated into a replication defective adenovirus. Despite the reduction in antigen-specific CD8+ cells after vaccine plus CpG immunization the enhanced destruction of sc and systemic tumors was shown to be mediated entirely by CD8+ T cells. Finally, the reduction of the CD8+ T cells was the result of an observed decrease in the proliferation of the antigen specific cell population. J Invest Dermatol. 2004 Aug;123(2):371-9. CpG motifs are efficient adjuvants for DNA cancer vaccines. Schneeberger A1, Wagner C, Zemann A, Lührs P, Kutil R, Goos M, Stingl G, Wagner SN. DNA vaccines can induce impressive specific cellular immune response (IR) when taking advantage of their recognition as pathogen-associated molecular patterns (PAMP) through Toll-like receptors (TLR) expressed on/in cells of the innate immune system. Among the many types of PAMP,immunostimulatory DNA, so-called CpG motifs, was shown to interact specifically with TLR9, which is expressed in plasmacytoid dendritic cells(pDC), a key regulatory cell for the activation of innate and adaptive IR. We now report that CpG motifs, when introduced into the backbone, are a useful adjuvant for plasmid-based DNA (pDNA) vaccines to induce melanoma antigen-specific protective T cell responses in the Cloudman M3/DBA/2 model. The CpG-enriched pDNA vaccine induced protection against subsequent challenge with melanoma cells at significantly higher levels than its parental unmodified vector. Preferential induction of an antigen-specific, protective T cell response could be demonstrated by (i) induction of antigen-dependent tumor cell protection, (ii) complete loss of protection by in vivo CD4+/CD8+T cell- but not NK cell-depletion, and (iii) the detection of antigen-specific T cell responses but not of relevant NK cell activity in vitro. These results demonstrate that employing PAMP in pDNA vaccines improves the induction of protective, antigen-specific, T cell-mediated IR. J Biomed Sci. 2016 Jan 25;23(1):16. doi: 10.1186/s12929-016-0238-3. Combination of the toll like receptor agonist and α-Galactosylceramide as an efficient adjuvant for cancer vaccine. Gableh F1, Saeidi M2, Hemati S3, Hamdi K4, Soleimanjahi H5, Gorji A6,7,8, Ghaemi A9,10,11. DNA vaccines have emerged as an attractive approach for the generation of cytotoxic T lymphocytes (CTL). In our previous study, we found That Toll like receptor (TLR) ligands are promising candidates for the development of novel adjuvants for DNA vaccine. To improve the efficacy of DNA vaccine directed against human papillomavirus (HPV) tumors, we evaluated whether co-administration of a TLR4 ligand, monophosphoryl lipid A (MPL), and Natural Killer T Cell Ligand α-Galactosylceramide(α-GalCer) adjuvants with DNA vaccine would influence the anti-tumor efficacy of DNA vaccinations. We investigated the effectiveness of α-GalCer and MPL combination as an adjuvant with an HPV-16 E7 DNA vaccine to enhance antitumor immune responses. By using adjuvant combination for a DNA vaccine, we found that the levels of lymphocyte proliferation, CTL activity, IFN- γ, IL-4 and IL-12 responses, and tumor protection against TC-1 cells were significantly increased compared to the DNA vaccine with individual adjuvants. In addition, inhibition of IL-18 signaling during vaccination decreased IFN-γ responses and tumor protection, and that this inhibition suggested stimulatory role of IL-18 in adjuvant effects of α-GalCer and MPL combination. The strong adjuvanticity associated with α-GalCer/MPL combination may to be an important tool in the development of novel and strong cancer immunotherapy. Cancer Sci. 2015 Dec;106(12):1659-68. doi: 10.1111/cas.12824. Epub 2015 Nov 18. Adjuvant for vaccine immunotherapy of cancer – focusing on Toll-like receptor 2 and 3 agonists for safely enhancing antitumor immunity. Seya T1, Shime H1, Takeda Y1, Tatematsu M1, Takashima K1, Matsumoto M1. Immune-enhancing adjuvants usually targets antigen (Ag)-presenting cells to tune up cellular and humoral immunity. CD141(+) dendritic cells (DC) represent the professional Ag-presenting cells in humans. In response to microbial pattern molecules, these DCs upgrade the maturation stage sufficient to improve cross-presentation of exogenous Ag, and upregulation of MHC and costimulators, allowing CD4/CD8 T cells to proliferate and liberating cytokines/chemokines that support lymphocyte attraction and survival. These DCs also facilitate natural killer-mediated cell damage. Toll-like receptors (TLRs) and their signaling pathways in DCs play a pivotal role in DC maturation. Therefore, providing adjuvants in addition to Ag is indispensable for successful vaccine immunotherapy for cancer, which has been approved in comparison with antimicrobial vaccines. Mouse CD8α(+) DCs express TLR7 and TLR9 in addition to the TLR2 family (TLR1, 2, and 6) and TLR3, whereas human CD141(+) DCs exclusively express the TLR2 family and TLR3. Although human and mouse plasmacytoid DCs commonly express TLR7/9 to respond to their agonists, the results on mouse adjuvant studies using TLR7/9 agonists cannot be simply extrapolated to human adjuvant immunotherapy. In contrast, TLR2 and TLR3 are similarly expressed in both human and mouse Ag-presenting DCs. Bacillus Calmette-Guerin peptidoglycan and polyinosinic-polycytidylic acid are representative agonists for TLR2 and TLR3, respectively, although they additionally stimulate cytoplasmic sensors: their functional specificities may not be limited to the relevant TLRs. These adjuvants have been posted up to a certain achievement in immunotherapy in some cancers. We herein summarize the history and perspectives of TLR2 and TLR3 agonists in vaccine-adjuvant immunotherapy for cancer. Adv Exp Med Biol. 2015;850:81-91. doi: 10.1007/978-3-319-15774-0_7. Molecular Programming of Immunological Memory in Natural Killer Cells. Beaulieu AM1, Madera S, Sun JC. Immunological memory is a hallmark of the adaptive immune system. Although natural killer (NK) cells have traditionally been classified as a component of the innate immune system, they have recently been shown in mice and humans to exhibit certain features of immunological memory, including an ability to undergo a clonal-like expansion during virus infection, generate long-lived progeny (i.e. memory cells), and mediate recall responses against previously encountered pathogens–all characteristics previously ascribed only to adaptive immune responses by B and T cells in mammals. To date, the molecular events that govern the generation of NK cell memory are not completely understood. Using a mouse model of cytomegalovirus infection, we demonstrate that individual pro-inflammatory IL-12, IL-18, and type I-IFN signaling pathways are indispensible and play non-redundant roles in the generation of virus-specific NK cell memory. Furthermore, we discovered that antigen-specific proliferation and protection by NK cells is mediated by the transcription factor Zbtb32, which is induced by pro-inflammatory cytokines and promotes a cell cycle program in activated NK cells. A greater understanding of the molecular mechanisms controlling NK cell responses will provide novel strategies for tailoring vaccines to target infectious disease. Cancer is the second leading cause of death in the US, accounting for almost a quarter of US deaths.1 The American Cancer Society estimates the total worldwide economic impact of cancer at $900 billion annually.2 Until recently, treatments largely relied on nonspecific toxic compounds that showed limited success. But treatment paradigms are beginning to change and an old observation about tumors and the immune system may be responsible for a new wave of cancer treatments. Using the immune system to regulate cancer progression traces its roots back to the 1890s when William B. Coley observed that bacterial infection often coincided with cancer regression. Coley developed the theory that post-surgical infections had helped patients to recover better from their cancer by provoking an immune response. He later reported the successfully creation of a filtered mixture of bacteria and bacterial lysates to treat tumors.3 The field progressed little over the following century until the comparatively recent explosion of research which has identified the mechanisms by which cancer cells evade detection by the immune system. Armed with this knowledge, researchers have identified several protein targets, most notably Programmed Cell Death-1 (PD-1)4 and Cytotoxic T-lymphocyte-associated protein 4 (CTLA-4)5, and more importantly, antibodies that act on these targets resulting in the activation of the immune system towards the targeting of cancer cells. To address this challenge Thomson Reuters analysts are applying knowledge based approaches and scouting biological pathways for potential new targets for immune based therapies for cancer. Our knowledge comes from a combination of retrospective analysis of ongoing development programs coupled with information extracted from the literature. We use this evidence to better understand the role of the immune system in fighting cancer. Scouting known targets for cancer immunotherapy and interrogating the regulators of these targets is one method to identify new potential targets. As an example we researched PD-1, the well-known checkpoint protein mentioned above. Analysis of the known transcriptional regulators of PD-1 highlighted that the majority of PD-1 expression is centered on activation of the JAK/STAT pathway and that targeting these proteins may represent a novel way to modulate the activity of PD-1. In addition, we uncovered interesting biomarkers for patient stratification or combination drug targets such as IFN-, NOTCH1, and the STATs. For novel targets we performed analysis of publically available gene sets of cancer patients to identify differentially regulated genes. Interrogating the differentially expressed genes and superimposing these onto proprietary canonical pathway maps for immune response we are able to identify several targets that can serve as starting points for immunotherapy drug discovery, biomarkers for disease progression, and for stratifying patients for clinical trials. The field of cancer immunotherapy is in its infancy but has already led to a shift in the treatment of cancer. Instead of treating the cancer, researchers are treating the immune system which in turn specifically targets only the cancer. And that is just the beginning. The knowledge gained from this research can be applied to diseases other than cancer, ushering in a new era of immunotherapy. Not a bad outcome even if it took over 100 years to come about. To learn more about themes covered at the Molecular Med Tri-Con 2016, read the BioWorld special report. 1. Globacan, International Agency for Research on Cancer; “Globocan 2012: Estimated Cancer Incidence, Mortality and Prevalence Worldwide in 2012. (2012). 2. American Cancer Society Cancer Facts and Figures. (2013). 3. Coley WB, The Treatment of Malignant Tumors By Repeated Inoculations of Erysipelas: With A Report of Ten Original Cases. The American Journal of Medical Sciences 10, 487-511 (1893). immunoreceptor. Immunity 11, 141-151 (1999). 5. K. M. Lee et al., Molecular basis of T cell inactivation by CTLA-4. Science 282, 2263-2266 (1998). 6. A. Swaika, W. A. Hammond, R. W. Joseph, Current state of anti-PD-L1 and anti-PD-1 agents in cancer therapy. Mol. Immunol. 67, 4-17 (2015). 7. A. C. Anderson, Tim-3: an emerging target in the cancer immunotherapy landscape. Cancer Immunol. Res 2, 393-398 (2014). 8. J. Arrowsmith, A decade of change. Nat. Rev. Drug. Discov. 11, 17-18 (2012). 9. J. Arrowsmith, P. Miller, Trial watch: phase II and phase III attrition rates 2011-2012. Nat. Rev. Drug. Discov. 12, 569 (2013). 10. P. Morgan et al., Can the flow of medicines be improved? Fundamental pharmacokinetic and pharmacological principles toward improving Phase II survival. Drug Discov.Today 17, 419-424 (2012). Immunotherapy trials comprise more than one third of the current clinical oncology space. As innovators race to market, challenges inherent in immuno-oncology (I/O) are being met. Predictive and prognostic biomarkers have become notoriously difficult to pinpoint and regulatory bodies are struggling to maintain pace with the burgeoning field. In taking a closer look at the 2,500 active I/O clinical trials in Cortellis Clinical Trials Intelligence, there are two classes experiencing interesting trends, each with their unique challenges. Therapeutic cancer vaccine trials have seen a shift in sponsors while steadily decreasing in number. Checkpoint inhibitors, meanwhile, have been rapidly gaining momentum. Specialized biotech companies and research institutions have taken on the challenge of therapeutic cancer vaccine development. Following Dendreon’s success in 2010 with Provenge (sipuleucel-T), the only therapeutic cancer vaccine approved by the FDA thus far, drug developers are employing diverse strategies to effectively introduce cancer vaccines to immuno-compromised patients while mitigating adverse or unintended effects. Although the majority of therapeutic cancer vaccine studies are in the early stages, approximately 10 percent are those that have progressed to late-stage trials. These numbers indicate both an interest in the class as well as modest success with trial candidates. On the opposite end of the spectrum, checkpoint inhibitor trials are exhibiting a rapid-fire growth pattern and tremendous success. Since 2010, they have experienced a twenty-fold increase in the number of commercially relevant trials as compared to those started in 2015. Anti-CTLA-4 trials comprise a quarter of the current space, while target newcomers, PD-1 and PD-L1, make up the remainder, with PD-1 being studied in more than half of current trials. PD-1 is a receptor on T-cells and binds ligands PD-L1 and PD-L2 to prevent T-cell activation. Upregulation of these proteins causes cancer cells to go unnoticed by the immune system. Inhibiting this checkpoint, however, lifts the veil, allowing the immune system to launch an attack. Both big pharma and biotech companies are active in the space and are taking on trials at almost double the rate of therapeutic vaccines. BMS, following up on their success with Yervoy (CTLA-4) and Opdivo (PD-1), are at the top of the space, followed by Merck (Keytruda, PD-1) and Roche. Early and late phase trials are split down the middle indicating both interest in the space and successful progression to phase III trials. Until recently, melanoma has been the top indication in the space; however it has since been surpassed by lung cancer. Advanced metastatic cancers, those where other treatments have failed, remain the top patient segments in checkpoint inhibitor trials. Challenges in this space lie in identifying predictive and prognostic biomarkers. Correlating response rate to the PD-L1 biomarker, which is currently seen in 39 percent of checkpoint inhibitor trials measuring biomarkers, is not always possible. Immuno-oncology is a highly marketable and dynamic space currently led by checkpoint inhibitors. However, as niches become saturated, developers must look to identify novel approaches. Immunotherapy and cross-class combinations are proving to be successful, and the recent approval of Amgen’s oncolytic virus (T-vec) for inoperable melanoma is giving hope that there are opportunities beyond T-cells. Our immune system is a complex defense structure full of cells ready to take on the fight against cancer – they just need the right orders.